Spring has finally started to make its presence known at the farmers market. Last week the first of the asparagus showed up and this week it was the peas. Of course I picked some up. I was thinking that I wanted to do something to showcase the freshness of the peas and that a fresh pea pesto would be perfect. Mint always makes things seem more refreshing so I added some of that along with some lemon to brighten things up. Pestos often contain a nut and I though that almonds would be a nice change. For the cheese I went with a sharper pecorino to contrast the sweetness of the peas. Pestos like this are super simple to make, just blend everything in a food processor. I really like to serve pesto on pasta so that was my first stop. The pea pesto on whole wheat penne was really good! It was light, refreshing, sweet and savoury all at the same time. I still had some of the pea pesto left over and it went well on crostini for a snack the next day. Mix everything in a food processor or with a mortar and pestle. Serve over cooked pasta or gluten free pasta and enjoy! Take a look at the Presto Pasta Nights roundup at Once Upon a Feast. Ahh, peas!! They haven’t arrived here yet, but I can’t wait!! 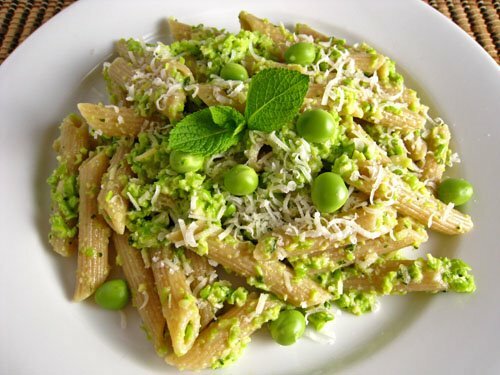 And what a lovely variation on pesto sauce, with the peas – yum! I don’t have a food processor– we’ll just have to see what my mortar and pestle (slash arm muscles) can manage, heh 🙂 I love all things leguminous, so this looks very good! That green is so vivid, I love it! This looks very beautiful and delicious Kevin! Nicely done! Fresh peas are a bit of a pain to shell, but the results speak for themselves. I can almost imagine the sweet minty goodness. Ooooh! This looks so delicious! I wish I could have a good pea pesto crostini snack.You always have something good and creative on your blog. A unique take on the pesto. Lovely idea using peas. I love that green! Love the idea of pea pesto Kevin! i love this idea, asparagus pesto on penne!! yummy! This sounds yummy – I’ve recently discovered I like peas so I would love to try this. kevin, looks great. nice touch with the mint. i can’t wait for the farmers’ markets here too. i’ll be trying to grab as much as the wallet allows! Do you know that I have never, ever purchased fresh peas?? Something about shellling them all frightens me. I absolutely love peas though so I should give it a go. Your creation looks like a great choice!! Anything with “pesto” catches my eye!! Delicious! I’ve never bought fresh peas either, but those look SO much better than any I’ve ever had. Beautiful dishes! I love the idea of a pea pesto – it sounds so fresh and spring-like! I love the beautiful green color! looks like a wonderful dish! Kevin, the colors came out so perfect. I don’t think I’ve seen a better grren color on food. It’s just beautiful. I want to make this for a Spring dinner! Thank you. Yum. That looks so refreshing and the color is gorgeous. Those peas are HUGE! What a great spring dish! I love the idea of using the leftovers on crostini. Kevin, another great post. I have to say I have really enjoyed following your blog, since I was first introduced to you by way of your mouthwatering tom yum soup when I hosted WHB. For what it is worth, I’ve tapped you as an outstanding blog that I admire. Looking great kevin! Love pesto and this is a great new idea! That looks so refreshingly green and springy! Gorgeous, Kevin! Ooh, that is a wonderful idea, Kevs. Can I call you Kevs? This looks so fresh and delicious, both on the pasta and the crostini. What a beautiful green color! I would love to try this. Great post, stunning photos and delicious recipes. What’s not to love! Thanks for sharing with Presto pasta Nights. Peas are one of my very favorite veggies. Spring is an exciting time for cooks! Wouldn’t that be lovely over asparagus…Hmmm….? I’m so taken by the pea/mint combo.Excellent work! Kevin, the pea pesto looks delicious! I love your ‘custom’ twist with the almonds and pecorino. We’ve had fresh peas here for a while now, but I noticed some nice ones at the market today. I’m putting this on the menu for next week – thanks! What a great combination. Love this recipe. Wow, fantastic colour. Sounds very good. Wow! Green has never been so glamorous before. Beautiful. what an interesting flavor combination! I love the sound of your pea pesto! It looks so good on crostinis. I’m not very fond of peas, but this makes me want to try it! This looks perfect–and I’m thrilled to find another way to use some of my fresh mint! This is my first visit to your blog and I’m glad I found it–looks like you’ve got some excellent recipes (and your photos are lovely). Looking forward to exploring the archives. It is 98 degrees today in town. I just made this pea pesto recipe using peas I picked up at Farmer’s this morning. The meal was superb! The perfect recipe for a very hot day. Your blog is awesome! You are very talented! This dish looks like my style of eating: pasta and fresh veggies. Yum. I was looking for a pea pesto for my fish fillet when I came across with your blog… I'm amazed! Your recipes are wonderful and the photos… Uau! My sister pointed me towards your site and I love following it and checking out all of your great recipes! Just wanted to let you know I tried this one out and LOVED it so much I blogged about it. :) Thanks for the delicious recipe!